The DS-U2-K satellite was a Soviet magnetospheric research satellite launched as part of the Dnepropetrovsk Sputnik program. The satellite was used to study charged particles and radiation in the Earth's magnetosphere. Regular observations of geoactive corpuscles and survey of anisotropic distribution of Earth’s magnetic field were carried out; upper atmosphere structure parameters were measured; global distribution of corpuscular fluxes was studied, and a relationship between the corpuscular flux intensity and the aurora luminosity was established. 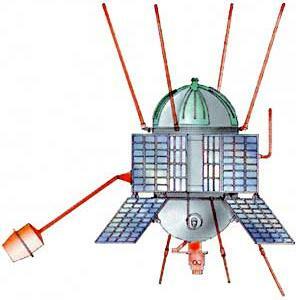 The only satellite of this type, Kosmos 426 was launched on 4 June 1971 on a Kosmos-3M booster from Plesetsk. It was operated until 12 January 1972, and subsequently remained in orbit until it decayed and reentered the atmosphere on 11 May 2002.